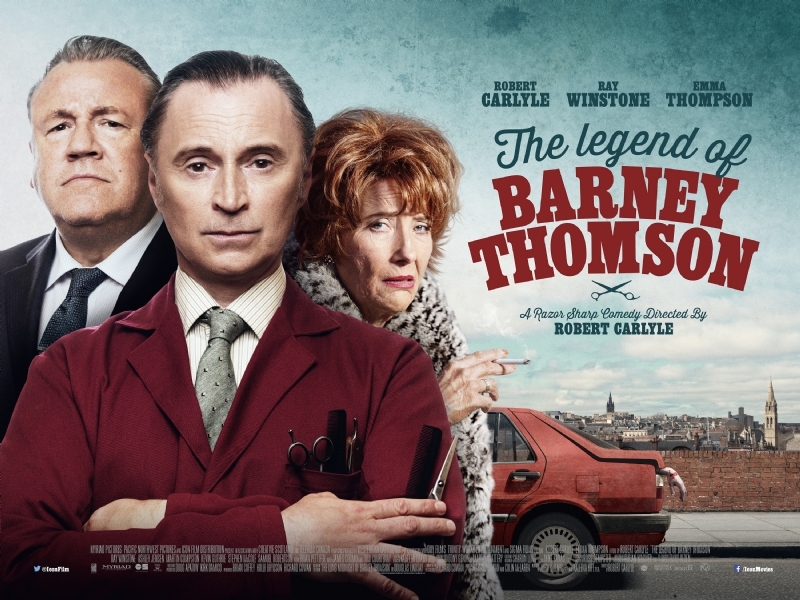 Pitchy is probably the best word for Robert Carlyle’s The Legend of Barney Thomson, the opening film of 2015’s Edinburgh International Film Festival. Having made the not unusual (nor unforgivable) choice to direct himself in the title role, Carlyle delivers a comedy jet black in tone, built around an inconsistent lead performance. Based on the first of Douglas Lindsay’s Barney Thomson series (which now runs to seven novels and four novellas), it’s the comic story of a diffident Glaswegian barber (Carlyle) who stumbles into a bloody murder spree, provoking the attention of a dogged, English policeman (Ray Winstone). It’s a sturdy foundation for Carlyle to construct what is ultimately an assured debut, countering cliché with wit, style and a strong script. First of all, Carlye’s film looks lovely, establishing early on a warm palette of worn brown and late-in-the-day sunshine to complement an early ’60s mise-en-scene. Opening the story in a retro Bridgeton barber specialising in vintage seats, warm towels and razor cuts, belies the films modern day setting. In fact, it’s not until the dialogue starts giving clues (“Last time I had a bird, Shakin’ Stevens was at number one”; a fleeting reference to Angie and Brad) that the time period becomes clearer. Despite that, the creditable production design seems to deliberately muddy the waters, concealing smaller detail – such as a newspaper clipping with a conspicuously vintage advert on the back – in plain sight, while all the coppers all rock a style a good deal sharper than any of their real world counterparts ever could. The soundtrack favours 1960s music of the not-completely-overplayed variety and, similarly, Carlyle makes good use of an inventive local eye for underused Glasgow locations. Overall, there’s a welcome sense of place and Carlyle and his team also get the best of familiar landmarks, most notably the Barrowland Ballroom. Generally, The Legend of Barney Thomson suggests Carlyle has the confident, steady hand and keen eye for collaborators necessary to segue effortlessly to a career on the other side of the camera. Which is good, because the film only really wobbles when, straddling the two positions, his performance seems to bear the strain. His characterisation of Barney reaches an overwrought panto pitch in an early scene, a moment awkwardly balanced later on when Carlyle calls on a familiar casual charm for a short, desperate and solitary monologue, the delivery of which doesn’t jibe at all with the character he’s set up. Barney’s problems stem from the fact he’s an short-fused oddball with “no chat”, and the transition to grinning “legend” isn’t completely earned. There’s a sense that while Richard Cowan and Colin McLaren’s script is perfectly solid, Carlyle on his best day would have conjured a more credible arc from it. Presumably taking a lead, if not overt direction, from Carlyle, his cast’s performances range from reliably solid to full-blown panto and to all points in between. Tom Courtenay nearly steals the show in an extended cameo as the irascible Chief Superintendent McManaman, while Ashley Jensen is on the right side of overwrought, hilariously, as Winstone’s nemesis, DI June Robertson. Winstone himself could perform his role with his eyes closed, but on the other hand is a perfect fit for it. Emma Thompson, in heavy make-up as Barney’s elderly mother, is nothing if not game, but perhaps a little too luxuriant in her Glaswegian vowels to be completely convincing in an admittedly pretty broad role (compare and contrast how effortlessly Tilda Swinton seemed to disappear into her Yorkshire crone for Snowpiercer). The cast is filled out by a host of recognisable faces and though there’s a sense Carlyle could easily have pulled up in a white van by a crowd of itinerant Glaswegian actors (jobs today for Stephen McCole, Martin Compson, James Cosmo, Barbara Rafferty and Brian Pettifer), everyone acquits themselves ably. The film’s climax does stretch credulity, even after a range of twists and turns, but the script is artful enough to address the strain in dialogue and just about scratches by on its wit. Squint and you may even perceive a bit of satire on Police Scotland’s recent rural trajectory, but ultimately the film is built more for laughs than verisimilitude or incisive commentary. Pitchy performances aside, though, the biggest criticism of The Legend of Barney Thomson is that it doesn’t really wring out either the comic potential or the plumb the absurd depths of its more risqué, grotesque or potentially bizarre elements. However, its poise, humour and general exuberance make it a worthwhile, not to say very promising, debut. The Legend of Barney Thomson is on general release from 24th July, 2015. This entry was posted in Edinburgh, EIFF 2015, Glasgow, Reviews and tagged Cinema, Edfilmfest, EIFF, Film, Glasgow, Movies, Review, Robert Carlyle, The Legend Of Barney Thomson. Bookmark the permalink. Emma Thompson is an performance by nomination Oscar actress in a supporting role.